My Kind Of Introduction: Have you tried Dr. Scholl's Massaging Gel Insoles yet? 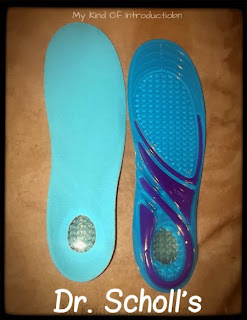 Have you tried Dr. Scholl's Massaging Gel Insoles yet? 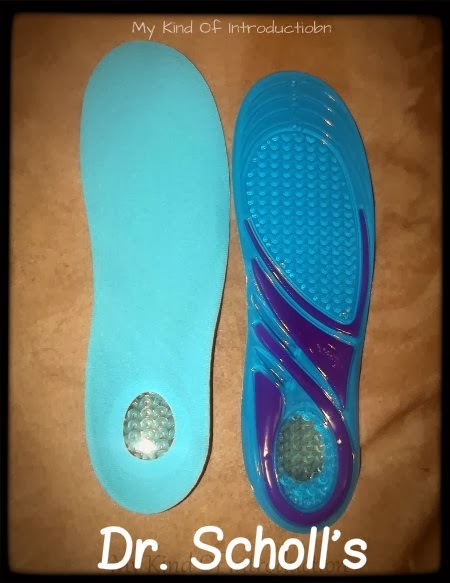 When I received a pair of Dr. Scholl's Massaging Gel Insoles to review for BzzAgent, I couldn't decide on which shoes I wanted to put them in. I switch between shoes often and the shapes are different so I wouldn't be able to cut the insoles to fit them all. So I left them in the package and sat them to the side until I made up my mind. When my fiance came home from work later that afternoon, it didn't take long before he noticed the insoles lying on the desk. He took one look before asking if he could have them. Even though the insoles were for women, they looked pretty much the same as men's, and he wanted to try them out in his work shoes. Alan works 2 jobs and is on his feet all day. For years, he's had trouble with his feet and back and we believe it's because the heels on his shoes wear down more on one side than the other. It's like his feet are off balance and it drives him up the wall. Since Alan truly needs the support and comfort more than I do, we trimmed the insoles and slid them inside his work shoes. All he needed to do was tell me what he thought! 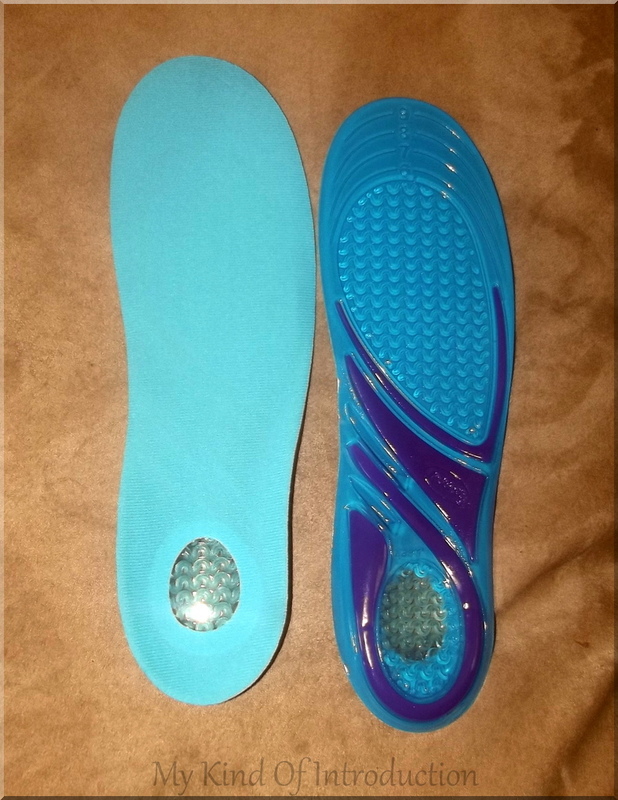 My fiance has been wearing the Dr. Scholl's Massaging Gel Insoles to work everyday for about a week now and has said that he definitely has felt a change! His feet haven't been hurting him as bad and he mentioned that he likes the way the gel feels when he walks and when he shifts his weight while standing. (I believe that feeling would be the Dual Wave Design massaging his feet!) Alan also admitted that he truly didn't believe the insoles would help his back much because his pain comes from more than just the unbalance in his feet. Surprisingly, within the past week he's noticed that the pain has eased off just enough to where it's not the main thing on his mind anymore. Alan's been able to concentrate more at work and move around a bit faster now that the pain has eased. He's even slid the insoles in his everyday shoes a time or two when he wasn't working! That confirms that my fiance is enjoying his Dr. Scholl's Massaging Gel Insoles. I personally have also noticed that when he comes home late a night after double shifts, Alan hasn't been complaining as much lately so it seems like the Dr. Scholl's Massaging Gel Insoles are doing their job as well!! Less back and foot pain puts him in a better mood and that's always a good thing in this household! We may have to buy a pair for Alan's regular shoes as well as some for me! Even though I had planned on trying out the Dr. Scholl's Massaging Gel Insoles for myself, I couldn't be happier with the results that my fiance has received. Working with pain is no joke and every bit of help counts! Alan puts in many long and hard hours to support our family so being able to help make things easier for him, makes me happy. It looks like Dr. Scholl's just found himself a couple new consumers! If only I could find massaging gel insoles small enough for my daughters......... then we could all have happy feet!